DOOLEN WELCOMES ARIZONA COYOTES AND TUCSON ROADRUNNERS! AT DOOLEN, OUR DIVERSE STUDENTS FEEL SAFE, COMFORTABLE, AND READY TO LEARN. Teaching and learning at Doolen doesn’t just involve math, language arts, social studies and science. Our faculty and staff put a priority on building relationships between teachers and students so that the diverse population feels safe, comfortable and ready to learn. Our objective is to shape productive citizens who can take part in society in a meaningful way. This entails building a common ground for students who come from a wide variety of backgrounds and come to the school with varying educational levels. •	Celebrates curiosity and lifelong learning. •	Honors and fosters diversity. •	Supports unity through a culture of civility and respect. •	Teaches the habits of personal success. •	Empowers productive citizens who make meaningful contributions. 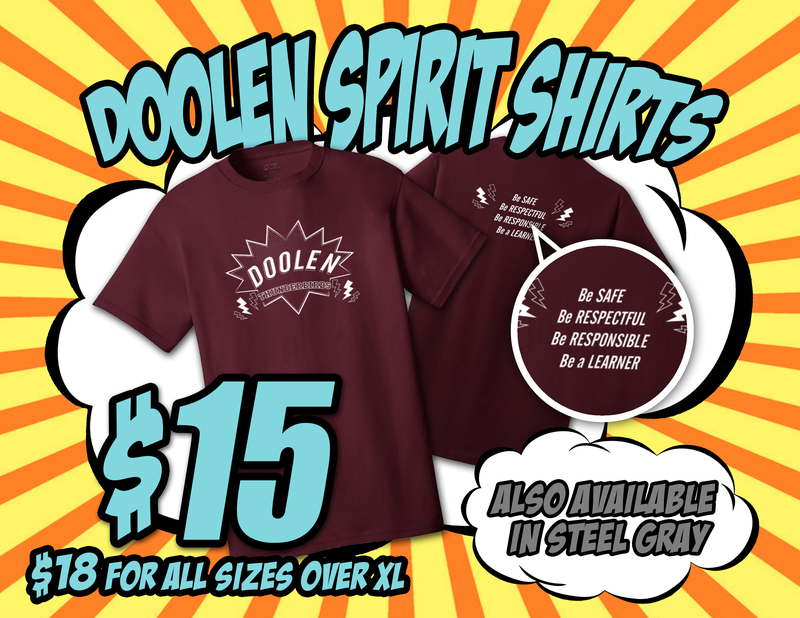 Doolen Spirit Shirts On Sale Now!